You are currently browsing the category archive for the ‘cheese rolling’ category. 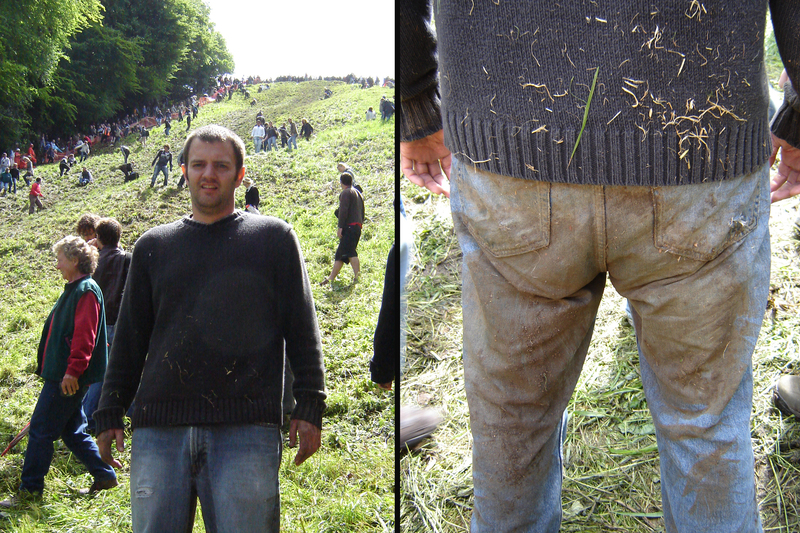 If you’re a regular follower of Anyone Can Enter, you know that Cheese Rolling holds a special place in my heart. You may also know that the annual event was cancelled this year due to public safety concerns, what with 15,000-plus spectators ascending on a narrow English hill meant to handle roughly the capacity of a typical double-decker London bus. Cheese Rolling organizers hope to resolve their safety issues and hold an official event next year, but that didn’t stop hundreds of cheese rollers from gathering at Cooper’s Hill today for an unofficial cheese rolling. —(Six-time champion Chris) Anderson said he visited the site last night to clear the hill of branches and stones. How awesome is that? Can you imagine Alex Rodriguez showing up at Yankee Stadium the night before the World Series to rake the infield? I think not. —Diana Smart, who makes the Double Gloucester cheese used for the popular event every year at her farm in Churcham, said: “People have been in and bought cheeses, but of course I don’t know what they bought them for. This is equally awesome. Although the article doesn’t specifically say this, it leads me to believe that Anderson bought the cheese for the unofficial event. –Here’s an alternative to chasing cheese, especially if you prefer going uphill, rather than downhill. In the Tetbury Woolsack Race, men carry 60-pound sacks of wool up a steep hill. And just like Cheese Rolling, there seems to be no good reason for doing this. Cheers!